Let Buyers and Sellers see what previous clients think of you in a professionally presentation. Easily collect, add and update testimonials from the people that matter to your business with a simple, easy to use dashboard from within your WordPress admin panel. Testimonials will then be automatically displayed on your dedicated testimonials page, scattered around your website pages, or added to pages as sliders. Our specially designed Testimonials Page page can can show all your testimonials. 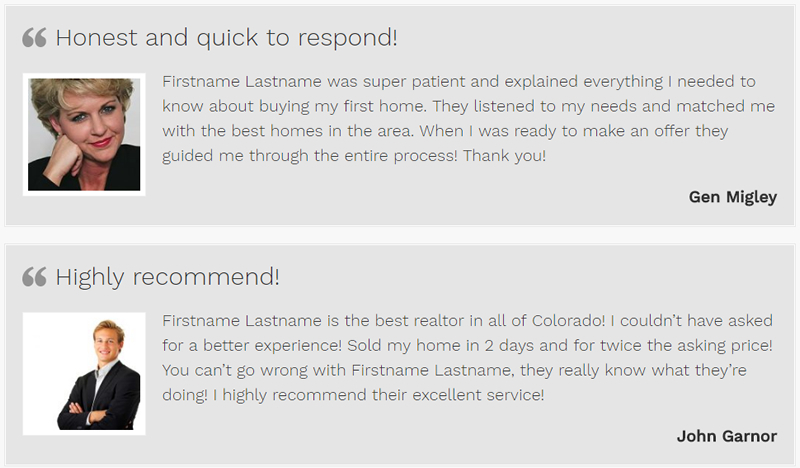 Testimonial slider showcases all your client testimonials one at a time using a cool slideshow presentation.